Welcome to our interview of Alan S. Blood on his busy blog tour. It’s quite lengthy so sit back and enjoy all that Alan has to say. A: I am sixty seven and a half years old and have had an amazing, highly stimulating and extremely varied life – which apart from my 25 year Teaching Career, has included many diverse jobs (not in chronological order) – ranging from builder’s/farm labourer to postman to office work – including Advertising/PR – to being PA to a Naval Commander ! I was an industrial Journalist and edited the ‘House Magazine’ of an electronics’ company involved in the early US ‘Gemini’ Space Programme. At University, I edited my College (Tabloid) newspaper ‘Tombull’. Teaching highlights include an ‘Exchange Programme’ (1983) in American Schools and organising a 2 day Industry/Education Conference (following a ‘post-grad’ course at Cambridge University). I was amongst the first Teachers to organise ‘Work Experience’ on a massive scale – addressed a London Conference on this. First started writing stories/articles for my own school newspaper (aged 14/15) – continued the writing of such throughout my life. My huge range of experiences provide a reservoir of places, people, situations and ideas that I still draw upon to this day. I live in a rambling Victorian (1873) house in Wales. My study overlooks the foothills of the Cambrian Mountains and the River Severn flows nearby. It is a wonderful place to write! Mathew: What genre do you generally write and have you considered other genres? A: The supernatural is my main genre – and this features largely in both of my published novels. Currently, I am writing in the genre of historical fiction. * See further Q/A below. Mathew: What have you had published to-date? Do you write under a pseudonym? A: ‘ONCE UPON A CASTLE’ is an illustrated novella – originally published in the UK (1997) – recently republished in the USA (2012) by GMTA PUBLISHING. ‘Cry Of THE MACHI A Suffolk Murder Mystery’ – published 2011 by ‘THE BOOK GUILD’. I do not write under a pseudonym. Mathew: Have you had any rejections? If so, how do you deal with them? A: Never had a rejection from Publishers – only from Agents. I move on and try elsewhere. Mathew: Have you won or been short-listed in any competitions? Won a major Poetry Award. Mathew: Do you have an agent? Do you think they’re vital to an author’s success? A: No – I found most Agents a complete waste of time and submitted direct to Publishers. Mathew: Are your books available as eBooks? Were you involved in that process at all? Do you read eBooks or is it paper all the way? A: Both of my novels are also available as eBooks. I was not ‘directly’ involved in the process. Mathew: How much of the marketing do you do for your published works or indeed for yourself as a ‘brand’? A: I am doing more personal marketing now – especially with respect to ‘Once Upon A Castle’ – which was republished in the US. A lot of the marketing/publicity for ‘Cry Of The Machi…’ was undertaken by my British Publishers: ‘The Book Guild’. Mathew: Do you have a favourite of your books or characters? If any of your books were made into films, who would you have as the leading actor/s? A: My favourite novel, to date, is ‘Cry Of The Machi A Suffolk Murder Mystery’. I would have Anne Hathaway as the female American ‘heroine’ with Brad Pitt as, in many ways, the hero NYPD cop. The protagonist ‘Lionel Palfrey’ would be wonderfully played by Kenneth Branagh. I do, however, think this is likely to become superseded by the Historical novel I am now writing. Mathew: Did you have any say in the titles / covers of your book(s)? How important do you think they are? A: I have had complete input in to all the titles / covers of my books. There was considerable negotiation regarding ‘Cry Of The Machi…’ Ultimately my views were accepted! Mathew: What are you working on at the moment / next? A: I am writing a major Historical novel about the theft of the Crown Jewels in the 17th Century – but I am keeping the details ‘under wraps’ ! (It will be published by GMTA). Mathew: Do you manage to write every day? Do you ever suffer from writer’s block? A: I try and mostly succeed in writing every day – but my work rate is frequently impeded by ‘promo’/marketing demands – which, although vitally important, can be frustrating ! Mathew: Do you plot your stories or do you just get an idea and run with it? A: Rather that ‘intricate plotting’ – I work to a general outline and enjoy letting the interaction between myself and the burgeoning ‘reality’ of characters and situations develop into the more deeper complexities of a main plot and sub-plots. Phillip Pullman has likened his similar approach to a ‘developing adventure’ – which becomes the never ending surprise ‘fun of writing’ ! Mathew: Do you have a method for creating your characters, their names and what do you think makes them believable? A: I do not have any ‘deliberate’ or specific method for creating my characters. Many of them are drawn (and modified) from people that I have encountered (worldwide) from a multitude of vast experiences and situations from my extremely diverse, stimulating and full life ! Mathew: Do you write any poetry? If so, why do you think it’s such a difficult market to break into? Are there any tips you could give to someone wishing to write poetry? A : I do not write much poetry nowadays – mainly because of the time constraints of writing prose – especially novels. I won the top award in the ‘Hastings International Poetry Festival’ (2003) with my long poem about ‘Litter’ entitled ‘Contrite Can Cannot’. I still read some of my past poems at regular ‘Poetry Evenings’ held in the Mid-Wales Arts Centre. Mathew: Do you write any non-fiction or short stories? A: I write short ghost stories and plan to publish them as book of such. Mathew: Do you do a lot of editing or do you find that as time goes on your writing is more fully-formed? A: I tend to edit as I write – and try to be economical with both the formulation and structure of my writing – so that a lot is compacted in. This has tended to make my books shorter than they might otherwise have been. Mathew: Do you have to do much research? A: Yes – very thoroughly. With ‘Cry Of The Machi…’ I went to Chile and visited the territory of the Mapuche Indians and their female ‘Machi’ witch doctors. ‘Once Upon A Castle’ was based upon visiting Bamburgh Castle and research upon Northumbrian castles, generally. Mathew: What point of view do you find most to your liking: first person or third person? Have you ever tried second person? A: With different work I tend to use either first and third person (but not together) – as appropriate. I have always considered second person to be a poorer form of English ! Mathew: Do you have pieces of work that you think will never see light of day? A: Yes – I have written a complete and quite disturbing psychological thriller entitled ‘Jackson’s Lane’ – concerning the total breakdown of a Teacher – leading to horrific murder and incarceration in Broadmoor Top Security Mental Hospital. I doubt whether this will ever be published – but who knows ? Mathew: What’s your favourite / least favourite aspect of your writing life? Has anything surprised you? A: As I have stated in a previous answer, I find the whole business of marketing/promotion very time consuming and frustrating – especially when hard efforts can be so little rewarded – particularly by some of sections of the ‘media’ for example ! Mathew: What advice would you give aspiring writers? A: Be confident about what you are doing and make sure that what you write has both ‘quality’ and a good standard of English ! As far as possible try to be ‘original’ and do not try to emulate others. Do not be put off by dismal tales of rejection – sooner or later it will happen to you – but keep at it ! If your ‘product’ is good – then it has a chance of success – and there are many so more outlets opening up all of the time – especially through different opportunities of self –publishing and internet on-line options – including the ‘eBook revolution’. Do not be afraid to by-pass Agents and submit direct to publishers. Investigate the opportunities offered by he ‘Small Presses’ ! Mathew: If you could invite three people from any era to dinner, who would you choose and what would you cook (or hide the takeaway containers)? Susannah York – Chicken Jalfrezzi ) ( LOL ) !!! Mathew: Is there a word, phrase or quote you like? A: “Tomorrow is cancelled due to lack of interest” ! Mathew: Are you involved in anything else writing-related other than actual writing or marketing of your writing? A: I am a founder member of a closely knit, small, democratically run writers’ group that meets sporadically – which is both mutually supportive and intimate. Mathew: What do you do when you’re not writing? Any hobbies or party tricks? I have several cameras – especially an SLR digital – with many Lenses (wide angle & telephoto) and accessories. I also paint (mainly water colours) and engage in ‘scraperboard engraving’. Mathew: Are you on any forums or networking sites? If so, how valuable do you find them? A: Yes : FaceBook, Twitter, LinkedIn and, especially, ‘Goodreads’. These have all been invaluable in promoting my work in diverse ways. I have two ‘FB’ Author’s Pages – one ‘personal’ – one from my GMTA Publisher. Both Twitter & LinkedIn have helped to widen my professional contacts – and the latter has enabled me to join writers’ websites/groups referred to above. ‘Goodreads’ led me to being very favourably reviewed by several US literary websites – and ultimately to ‘signing’ with my American Publisher: GMTA Publishing. Mathew: What do you think the future holds for a writer? A: The monopoly of Agents and Publishers as to who becomes published or not has now been substantially diminished. The whole literary world is at a crossroads – in many ways exciting – in other ways quite frightening! As mentioned above (with advice for aspiring writers) technology has now provided increasing opportunities for writers to have their work published/presented in so many different ways. I feel that, despite eBooks, many people still prefer the printed book (hardcover or paperback) – and because of self –publishing many publishers are becoming scared as to their future –and smaller houses could go out of business! This might actually provide more opportunities for the imprints that do remain to accept more submissions and offer more contracts to new writers – who knows? I think it is certain that the relative ‘hegemony’ of many Agents and ‘Agents for Agents’ will become a thing of the past – they have had it their own way for long – and there are far too many ‘cowboy outfits’ willing to take money from desperate, gullible ‘rookie’ Authors who are desperate to try anything to become published. All of this is changing through technology! Mathew: Where can we find out about you and your work? Mathew: Is there anything else you’d like to mention? Mathew: Why do you write? In answer to your Q as to why I write – it is simply a compulsion that I have had since adolescence – I never get ‘writers’ block’ – and am at my happiest when the ‘keyboard is racing’ !!! Here is a short except from ‘Once upon a Castle. IT EXEMPLIFIES SOME OF THE ‘SUPERNATURAL’ ASPECTS OF THE BOOK. 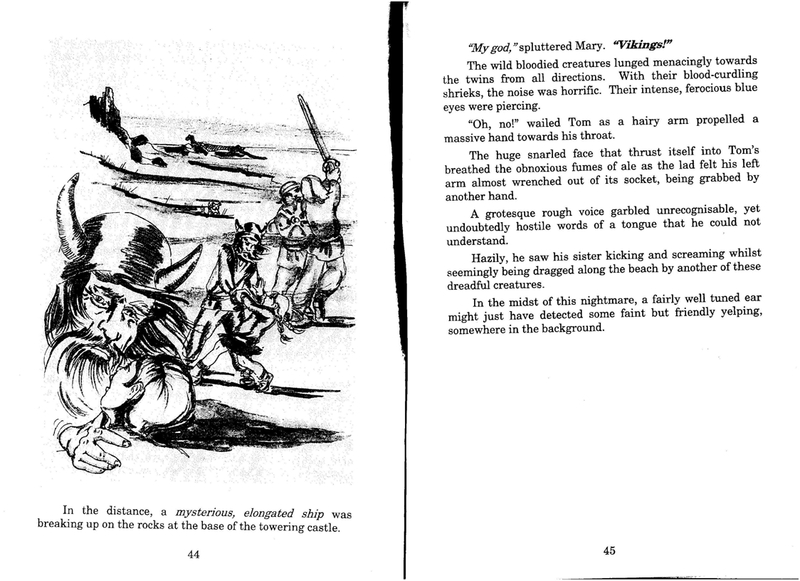 (N.B – THE REPUBLISHED EDITION HAS THE SAME CONTENT & ILLUSTRATIONS). THE TEXT CAN BE SCROLLED/‘ZOOMED ‘ TO A LARGER SIZE. Alan was asked to give a short synopsis of his novel, something that I find most difficult to do. Uncle Toby had said that there would be castles to explore, with ghosts and things. This helps to cheer up the glum twelve-year old Lovell twins, Tom and Mary, leaving their schools and loving parents to be evacuated to wild Northumbria during World War II. Then the adventure begins. They live with their Aunt Victoria and Uncle Leslie, meet the loveable ‘Mrs. M’, a strange dog called ‘Scamp’ and, worst, the terrible private tutor, Miss Urquart, from whom they run away to find a mysterious castle seen through an old telescope. Now they are drawn into bizarre supernatural events of a time-warp between the war itself and ancient warfare. 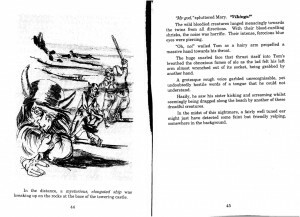 They encounter dark forces, as the story twists and turns, and are even rescued by the Royal Navy. Yet, this is only the beginning of more unexpected tragedies before the twins begin to escape from it all. Alan S. Blood worked in the Civil Service, Advertising and Journalism before qualifying as a Teacher from the University of Reading. He had a long, distinguished Career in Primary and Secondary Schools – aspiring to Senior Management. As Head of English and Drama he gained considerable knowledge of youngsters’ literature. Alan now writes novels, plays, screenplays and poetry. He won first prize in the ‘Hastings International Poetry Festival’ (2003) with his poem ‘CONTRITE CAN CANNOT’. 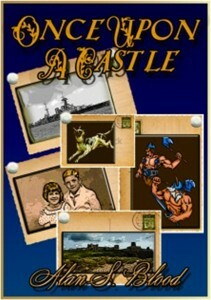 ‘ONCE UPON A CASTLE’ is a YA ghost story, enjoyed by adults, set in World War II concerning a real and a phantom castle. Alan travelled the world and researched, in Chile, for his supernatural crime thriller ‘CRY OF THE MACHI A Suffolk Murder Mystery’. He was a Morris Dancer and the novel conflicts good and evil forces linking a Chilean ‘Machi’ and ‘organised crime’ to Suffolk Morris Murders. His work largely features the paranormal. Thank you again for taking part in this blog interview. I’m very grateful for you taking time out from your writing to answer these questions and wish you all the best with your future projects. Alan has a guest post on The One Saga, read it here. You can follow Alan via many different social media: Website: Goodreads: Facebook: Facebook Like Page: Twitter: His novel ‘Once upon a castle’ is available at Amazon: Barnes & Noble: Createspace: Kobo. Written by: Mathew Bridle on January 20, 2013.